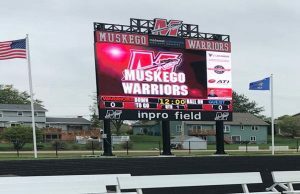 Wisconsin’s largest high school video display is now home at Muskego High’s field. Designed and manufactured by Daktronics, the display measures 17 ft. high by 30 ft. wide. A scorer’s table joins Muskego’s fleet this fall, acting as another digital solution. With the revenue the outdoor display raised, the school opted to add the additional display inside the school. The table measures 3 ft. high by 19 ft. wide and features 6mm line spacing.